Are you feeling tired, stressed and sick, but dont know why? from the food we eat (over 10,000 chemicals are used in processed foods alone! ), the air we breathe and the water we drink. In fact, there are even toxins hidden in our houses and clothing from chemicals used in cleaning products, soaps and shampoos, paints and fabrics. In total there are 80,000 registered toxic substances in our environment with nearly 1500 being added each year. So if you want to be healthy, what do you do? The First Things First holistic approach says that with all this toxic baggage, you need to dump your junk to get started towards better health. The answer is to detoxify. But detoxification can be somewhat complex when you look at all the options out there. Here at Holistic Care of Charleston, we take the guesswork out of detoxification, so that you can get started on the path to feeling better, looking younger and improving your energy for your work and your life. Your body WANTS to heal and with detoxification therapy, you give it a fighting chance to create your best health. Our comprehensive diagnostic testing detects toxicity in your body and allows us to create a customized action plan for your health and well being. We also educate you about how to make the kinds of choices that allow you and your family to create your best health, one step at a time. In fact, research suggests that toxins are behind many of the chronic, debilitating illnesses of our time. Let Holistic Care of Charelston help you purify your body and your life from toxic overload. Did you know that a slight raise in body temperature can boost your bodys natural detoxification systems and immune function? One of the best ways to increase your body temperature naturally so you can heal is with far infrared sauna therapy. Your bodys tissues normally produce infrared energy, used by your body for a number of healing processes. By delivering penetrating warmth to the body, the far infrared sauna increases your bodys own infrared energy levels, enhancing your ability to heal. Unlike the heat produced in traditional saunas, far infrared heat is able to penetrate your body to a depth of 1.5 to 2 inches. 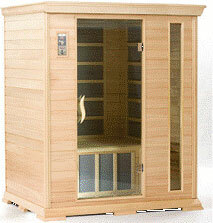 This stimulates your bodys immune system and cellular detoxification more effectively than a traditional sauna. Additionally, far infrared saunas are better tolerated than steam saunas because the heat is not felt on your skins surface. * People with advanced symptomatic heart disease, unstable angina, or severe adrenal suppression should use the sauna only under close medical supervision.